Forming shields are easily adjusted to control material flow. This allows the operator to match the windrow width to harvesting requirements. A swathboard is in base equipment for additional control of the windrow formation (for 630 and 635 MoCo models only). The rotary cutterbar is designed and built by John Deere. Large oval disks with free-swinging knives are used to cut the crop. All cutting disks are the same and are computer-designed for improved wear and cutting performance. Cutting disks are made of high-strength austempered steel to ensure the steel is thoroughly and evenly tempered for good wear characteristics. The disks rotate to give a knife-tip speed of 307 km/h (191 mph) for clean cutting. The knives are free-swinging to reduce damage if a solid object is struck, and they are reversible to double the useful life. The knives are removed at the front of the cutterbar for convenience. Made of austempered heat-treated ductile steel for excellent wear characteristics, wear caps are installed on each end of the cutting disks (except on the end disks where crop accelerators are used) to increase the wear life of the cutting disks and knife-bolt nuts. Wear caps are open on the end to prevent debris from packing in close to the nut, making hardware and knives easier to change. 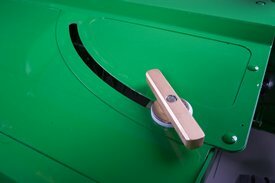 John Deere's patented design cutterbar is made from individual, diagonal-cut modules. Serviceability is easy. Modules can be removed individually while leaving the cutterbar attached to the frame. Made of high-strength nodular-iron castings, each module consists of two idler gears and one drive gear. The large-diameter idler gears transmit power from module to module. The idler gears turn at a relatively slow speed for added durability. The smaller-diameter pinion drive gear is used only to power the cutting disk. Power is not transmitted from one cutting disk to another except through the large-diameter idler gears. The modules are interchangeable. Disk rotation is determined by the position of the quill (A). There is a rubber oil seal between each cutting module. Impeller conditioning is standard equipment on all John Deere mower-conditioners. Proper conditioning in a wide range of crops can be achieved when the conditioner is properly adjusted. The impeller conditioner works well in legumes, especially alfalfa and most all-grass crops. Impeller conditioners are not recommended for thick-stemmed or cane-type crops, such as sudan or sudex, or crops over 5 ft tall. 33 V-shaped tines are on the 625 MoCo; 45 V-shaped tines are on the 630 and 830 MoCo; and 57 V-shaped tines are on the 635 and 835 MoCo. Tines are free swinging to reduce damage to the conditioner if rocks or other solid objects are struck. Scuffing action removes the waxy surface from the stem of the plant to allow faster evaporation of moisture. Conditioner hood opening is adjustable to accommodate various crop volumes. Crank handle allows an infinite number of adjustments between the minimum and maximum conditioning levels. The closer the hood is to the tines, the more aggressive the conditioning. Conditioner position indicator provides an easy reference point to control the degree of conditioning. 3. The speed at which the tines rotate will also affect the degree of conditioning. Two impeller speeds can be achieved by interchanging the upper sheave (A), located under the shield, and the lower sheave (B). With the sheaves in the position shown, the impeller turns at 870 rpm; this is ideal for grasses. 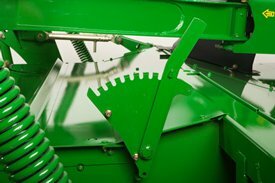 If the sheaves are reversed, the impeller turns at 630 rpm; this is ideal for legume crops. 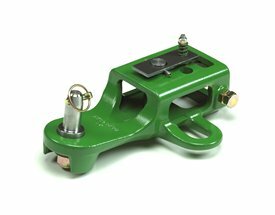 The drawbar equal-angle hitch is designed to be towed by a tractor only, and includes a screw jack and safety chain. Turn limiters may be required to prevent powerline damage if the hitch point of the tractor is beyond the rear drive wheels of the tractor. An overrunning clutch is located near the platform gearcase on all models. 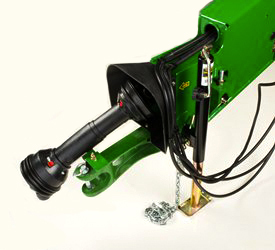 This design enables free rotation of the tractor hookup to make attaching to the tractor easier. On 540-rpm machines (optional on model 630 only), a slip clutch is incorporated into the overrunning clutch to provide protection to the platform. No clutch is required on 1000-rpm machines due to the reduced torque loads. 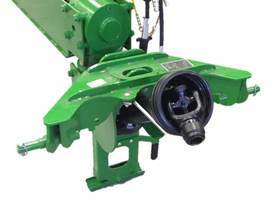 The clevis hitch is in base equipment on the 630 and 635 Mower-Conditioners. This design attaches directly to the tractor drawbar for operator convenience. The heavy-duty clevis design provides a strong attaching point to the drawbar. 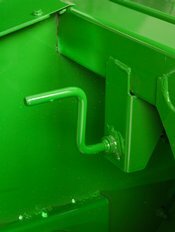 For added convenience, the hitch pin retaining bracket can also be used to store the PTO shaft when the machine is not attached to the tractor. 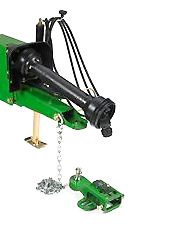 The clevis hitch is designed to be towed by a tractor only and includes a screw jack and safety chain. For added maneuverability, the 630 and 635 Mower-Conditioners offer an optional rockshaft swivel hitch. Turn limiters are not required with the swivel hitch. The swivel hitch is available in 1000 rpm power take-off (PTO) only. It attaches to the lower lift arms of a Category 2 or 3N 3-point hitch with or without quick-hitch. 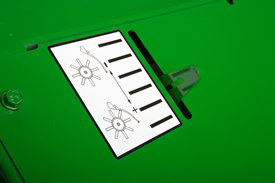 This option enables cutting square corners as well as making it easier to cut around field obstacles. Tractor hookup U-joint angles remain constant for reduced driveline noise and vibration in turns. NOTE: If the platform is to be maneuvered while under power, it is recommended the rear powerline with single constant-velocity (CV) U-joint be ordered. A powerline support cable keeps the tractor hookup out of the dirt when detached from the tractor. The parking stand allows quick and easy hookup. A down stop chain is also included that limits the travel of the rockshaft to help prevent implement driveline damage. The 630 and 635 Side-Pull Mower-Conditioners and the 830 and 835 Center-Pivot Mower-Conditioners are available with a urethane roll conditioner. The urethane roll conditioner works well in legumes, especially alfalfa, and most all-grass crops. In general, roll conditioners are better suited for thick-stemmed, cane-type crops, and crops more than 1.5 m (5 ft) tall. This process ensures the rolls are straight and cylindrical, so they can be accurately spaced close together for uniform conditioning along the length of the roll. An intermittent recessed cleat design gives more crimping edges for greater pressure per square inch, which results in superior conditioning and faster crop drying. Gearbox uses heat-treated, steel-forged spur gears for added strength. Drive gears operate in a sealed environment to prevent excessive wear or contamination. Telescoping drivelines ensure positive drive. Spur gears have two to three teeth intermeshing at all times for a smooth, positive drive.